How to get it all done. Working around my inner clock, not against it. I am not a night owl. My inner clock shuts off as soon as it gets dark outside (growing up in Siberia that meant 4 pm in winter!). In an ideal world I would finish all daily tasks by early afternoon and relax the rest of the day, since it is hard for me to be productive in the second half of the day. Well, in an ideal world I wouldn’t have kids to take care of in the evening. But that would by no means be an ideal world. You see, there is no such thing as “ideal” schedule, so I just have to make the best out of the one I have; that’s why I schedule the most demanding tasks for the first part of the day. 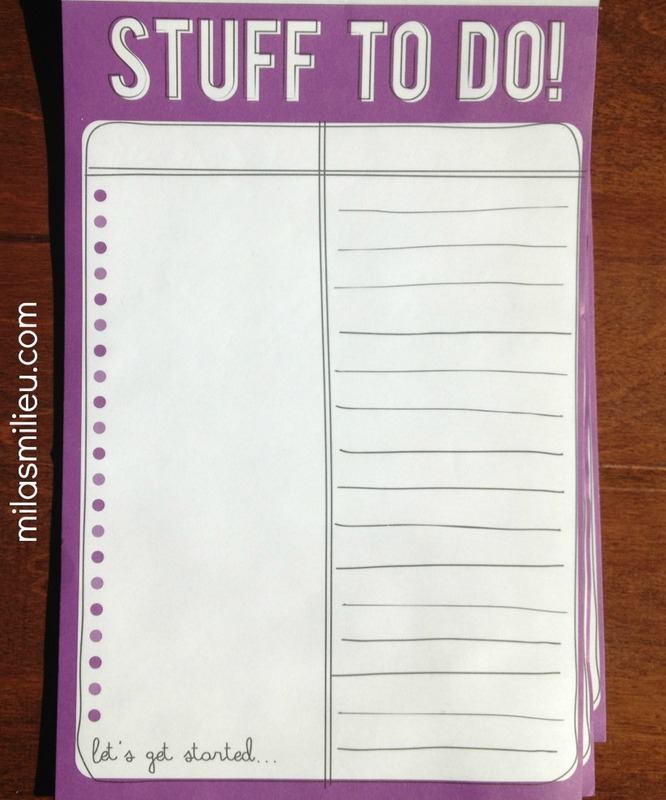 It is key to keep daily to-do list short– 2-3 tasks! I only include things that absolutely have to happen today (I also have a mile-long master list of all running projects and long-term tasks, but I don’t refer to it on a daily basis). I recommend maintaining the to-do list in the format that suits your personal style — note pad, sticky notes, iPhone app, etc. I use a combo of a note pad and an iPhone app. I found that for me pretty stationary is not conducive to increased efficiency, so I don’t bother to embellish my note pads. But if plain paper kills your motivation– go ahead and make it pretty. The goal is to make the to-do list work for you. Updating calendar and remembering to refer to it. I use a combination of a family calendar located in the home office as a part of our Command Center (to have the calendar accessible to the kids so they knew what events are happening when), and my iPhone calendar (so I had access to it when I am out and about). I like how the kids are learning to refer to the calendar, and plan their week. It helps them keep their things under control. Preparing for my least productive time. Keeping an “Action required” folder on my desk. To make sure those daily tasks get done fast, it is very helpful to keep all relevant paperwork handy. Nothing worse than digging in a pile of random papers and not finding that one form you have to send in today! I try to keep the contents of the folder to a minimum, and move “completed” papers either to the filing cabinet, or get rid of them. I am always on a look out for more tips. So, if you have any — please share! Yes, as much as it is tempting to squeeze in as much as possible on my to-do list, it only backfires when I look at all the unfinished tasks. Being realistic, as you said, is key to me!